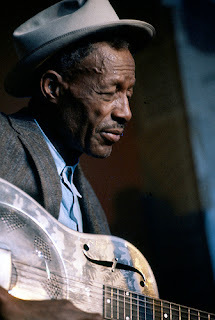 I spent a long time recording the pieces of "Dreams", in the middle of which I took a break with Son House's "Preachin' Blues". As is often the case, I first heard "Preachin' Blues" via one of my favorite bands, The Derek Trucks Band. Their dirty, knuckles-bare cover kicked off dTb's 2nd album, 1998's Out of the Madness. It is a foot stomper, especially with Matt Tutor's gritty singing (it would be several years before Derek found Mike Mattison to be the definitive voice of his band). Years later Derek would incorporate the song into The Allman Brothers' sets on rare occasion, usually as the first half of an encore. Featuring just Warren and Derek, it was a uniquely stripped down performance for the typically 7-piece wall of sound. It was also one of the rare occasions The Allman Brothers would not feature a founding member on stage. 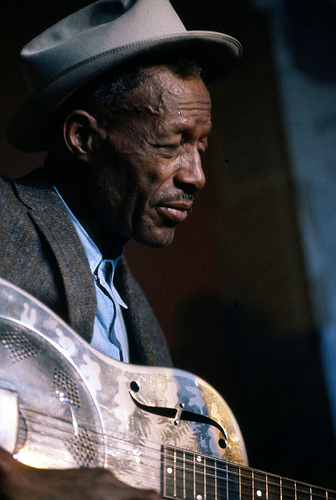 In the end, it is Son House's back-porch yelling on the original that defines the song. I wanted to keep it simple, and wasn't sure if I could pull the song off (some times less is more difficult than more), but also wanted to incorporate some bass and stomp box. It's definitely very different from the mostly instrumental pieces I've recorded thus far. After showing a passing interest in the song "Midnight Rider", my brother bought me The Allman Brothers Band: A Decade of Hits for my birthday. Initially, not every song jumped at me (eventually they all would - and then some), but I found myself spinning the disc over and over nonetheless. "Midnight Rider", "Statesboro Blues", and "Blue Sky" were immediate ear candy to me, but another song that was unlike anything I had ever heard slowly seeped into my brain more than any other: "Dreams". Chalk it up to my untapped interest in jazz at the time (the structure is pure "All Blues") or just being 13 years old, but the ethereal 3/4 waltz pulse and the slow burn of Gregg Allman's lyrics and Duane Allman's slide guitar made it a fast favorite. The song became a concert staple for the Allmans and a set piece for Duane Allman who typically shared lead duties with Dickey Betts. The SUNY Stonybrook Archival release features a version clocking in at nearly 20 minutes - nearly 3 times longer than the studio version. 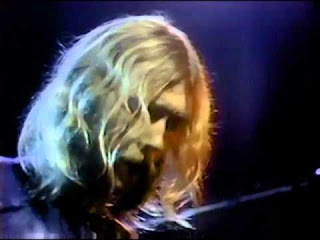 The song never became the cultural phenomenon that its monstrous brother, "Whipping Post", eventually became, perhaps due to the band retiring "Dreams" after Duane Allman's death (the exception being a lush arrangement with strings and horns put together by Gregg Allman for his solo tours). However, it remained a central cut for the band and fans, and was used as the title of the band's 20th anniversary 4-disc retrospective and reunion tour. Thanks to the return of a slide guitarist to the band (Warren Haynes) for the Dreams tour and reunion, the song was dusted off and returned as a set piece for each of the band's rotating slide guitar virtuosos up until the band's final show October 2014. Even Dickey Betts, who was never comfortable playing Duane Allman's slide guitar parts, would masterfully tackle the first half of the solo section until his dismissal from the band in 2000. The song remained relatively the same, with each guitarist adding their own flavor, as evidenced by the legendary Fox Box concerts, which documented the Allmans' three night stand at the historic Fox Theatre in Atlanta, GA, in 2004. 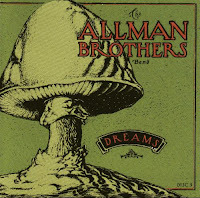 "Dreams" was the only song repeated and featured a different player (Haynes, Derek Trucks, Jack Pearson) taking the solo each night. Perhaps due to the song's subtleties, or perhaps due to the incredible talent needed to even think about playing the solos live onstage, the song has rarely been covered. Gregg Allman's good friend, drummer Buddy Miles, took an Otis Redding-ish spin on the song rather than attempt to replicate the Allmans' modal jazz swing. Less successful, southern rockers Molly Hatchet covered Buddy Miles' arrangement of the song, which borders on parody. I wanted to put my spin on the song, but without reinventing the wheel. I knew it was going to be piano instead of swirling hammond organ, and resophonic guitars instead of Gibson Les Pauls, but wasn't sure how it would all take shape. I even thought about adding fiddle and tenor saxophone, but the song is better when kept simple (and I can sing about as well as I can play fiddle, which isn't very well). I'm not sure it's always successful, my time-keeping and singing probably aren't up to the task, but regardless, here is my take on The Allman Brothers Band's "Dreams".